Abiraterone Acetate is an acetate salt form of Abiraterone which is a steroidal cytochrome CYP17 inhibitor with IC50 of 72 nM in a cell-free assay. Concomitant Western blot analysis of ER and TFF1 assessed after 16 h treatment with E2 or abiraterone in the presence or absence of MG-132 (10 μM). Br J Cancer, 2018, doi:10.1038/s41416-018-0158-y. Abiraterone Acetate purchased from Selleck. BCaPT10 and BPH-1 cells were treated with vehicle (NTC, white bars), 10 uM abiraterone (ABI, gray bars), or abiraterone plus steroid hormones (black bars, 100 nM DHT, 10 nM estradiol, and 10 nM progestin). Minimum of 200 cells per condition was used from each of at least 3 independent experiments. Each result is shown as the average 盨EM from at least 3 independent experiments. One-way ANOVA. *, P < .05; **, P < .01; ***, P < .005; ****, P < .001. Endocrinology 2014 155(2), 358-69. Abiraterone Acetate purchased from Selleck. Inhibition study of expressed orendogenous 5α-reductase-3 enzymeintheabsenceandpresence of 100 and150 nM abiraterone at pH7.4 using 1.0 μM testosterone as substrate. Prostate 2013 74, 235-49. Abiraterone Acetate purchased from Selleck. Abiraterone is a drug used in castration-resistant prostate cancer. Following intraperitoneal administration in a rodent model, abiraterone was found to have rapid deacetylation. When administered as its acetate pro-drug (CB 7630), it suppressed circulating testosterone to undetectable levels and markedly decreased the weights of androgen sensitive organs. Abiraterone is well tolerated and the mean elimination half-life of abiraterone in these studies was 27.6 h (thus supporting the use of once-daily dosing). Preclinical studies with abiraterone demonstrated reduction in androgen production downstream of CYP17 which resulted in decreased weight of the ventral prostate, testis, and seminal vesicles in mice. Microsomes are diluted to a final protein concentration of 50 μg/mL in the reaction mixture which contains 0.25 M sucrose, 20 mM Tris-HCl (pH 7.4), 10 mM G6P and 1.2 IU/mL G6PDH. After equilibration at 37 °C for 10 minutes, the reaction is initiated by addition of βNADP to obtain a final concentration of 0.6 mM. Prior to the distribution of 600 μL of the reaction mixture in each tube, test compounds are evaporated to dryness under a stream of nitrogen and then are incubated at 37 °C for 10 minutes. After incubation with Abiraterone, 500 μL of the reaction mixture is transferred to tubes containing 1 μM of the enzyme substrate, 17OHP. After a further 10 minutes incubation, tubes are placed on ice and the reaction is stopped by addition of 0.1 ml NaOH 1N. Tubes are deep-frozen and stored at -20 °C until assayed for Δ4A levels. A Δ4A RIA is developed and automated on a microplate format in our laboratory using a specific antibody against Δ4A and instructions provided by Biogenesis. The separation of free and bound antigen is achieved with a dextran-coated charcoal suspension. After centrifugation, aliquots of the clear supernatant are counted in duplicates in a liquid scintillation counter. The Δ4A concentrations of unknown samples are determined from the standard curve. The detection limit is 0.5 ng/mL and the within and between assay coefficients of variation are 10.7 and 17.6%, respectively at an assay value of 13 ng/mL. The rate of enzymatic reaction is expressed as pmol of Δ4A formed per 10 minutes and per mg of protein. The value of maximum activity without inhibitor (control) is set at 100%. The IC50 values are calculated using non-linear analysis from the plot of enzyme activity (%) against log of inhibitor concentration. LNCaP and VCaP cells are seeded in 96-well plates and grown in CSS-supplemented phenol red-free or FBS-supplemented media for 7 days. Cells are treated with Abiraterone at 24 hours and 96 hours after plating and cell viability is determined on day 7 by adding CellTiter Glo and measuring luminescence. Pinto-Bazurco Mendieta MA, et al. J Med Chem. 2008, 51(16), 5009-5018. Li R, et al. Clin Cancer Res. 2012, 18(13), 3571-3579. Duc I, et al. J Steroid Biochem Mol Biol. 2003, 84(5), 537-542. Richards J, et al. Cancer Res. 2012, 72(9), 2176-2182. Iacovelli R, et al. Anticancer Drugs. 2012, 23(3):247-54. Rehman Y, et al. Drug Des Devel Ther. 2012, 6:13-8. Alizarin : CYP1A1, IC50=6.2 μM; CYP1A2, IC50=10.0 μM; CYP1B1, IC50=2.7 μM. Abiraterone : CYP17, IC50=2 nM. Abiraterone : Approved by FDA for castration-resistant prostate cancer. TAK-700 (Orteronel) : Potent and highly selective human 17,20-lyase inhibitor with IC50 of 38 nM, Phase III for metastatic, hormone-refractory prostate cancer. 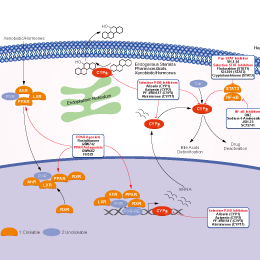 Abiraterone is a potent CYP17 inhibitor with IC50 of 2 nM in a cell-free assay. Features:Approved for the treatment of docetaxel-treated castration-resistant prostate cancer. Voriconazole is a new triazole derivative similar to fluconazole and itraconazole that acts by inhibiting fungal cytochrome P-450-dependent, 14-alpha-sterol demethylase-mediated synthesis of ergosterol. Apigenin is a potent P450 inhibitor for CYP2C9 with Ki of 2 μM. Features:Much more potent than kaempferol and myricetin in CT-L inhibition. Itraconazole is a relatively potent inhibitor of CYP3A4 with IC50 of 6.1 nM, used as a triazole antifungal agent. Avasimibe inhibits ACAT with IC50 of 3.3 μM, also inhibits human P450 isoenzymes CYP2C9, CYP1A2 and CYP2C19 with IC50 of 2.9 μM, 13.9 μM and 26.5 μM, respectively. Fluconazole is a fungal lanosterol 14 alpha-demethylase inhibitor, which thereby prevents the formation of ergosterol,used in the treatment and prevention of superficial and systemic fungal infections.